1. There is a sorcerer who lives in the basement of the castle. His name is Cedric the Sensational. However, in the early episodes, Sofia kept pronouncing it as “Seedrick,” even as he repeatedly corrected her. Why? And why did it just stop one day? For someone supposedly so clever, this made her look quite dumb. A: I’ve seen kids (even smart ones) mispronounce the same words over and over. Ceedric is the word Sofia just can’t get right until she gets older. Also Cedric didn’t deserve to have his name pronounced correctly. 2. Amber is often jealous of Sofia’s amulet, even stealing it from Sofia’s neck one night in her sleep. This begs the question: why did King Roland give a magical amulet (that we later learn was owned by his sister when she was a child) to his stepdaughter but not his own biological child? A: Roland didn’t know the amulet was magical when he gave it to Sofia. He thought it was nice jewelry. 3. Speaking of which, King Roland II is often referred to as the greatest king Enchancia has ever had. Why? He fucks up constantly and does very little to help those that aren’t also kings. One day, he lets his prepubescent son be king for a day so he can go relax. He’s the George W. Bush of royalty. How is he the best? Was Enchancia previously helmed by Stalin and Hitler? A: Question #6 answered Question #3: Roland II is the people’s king. The kind of king people want to have an ale with. 4. What happened to Roland’s wife? Originally, I thought it was maybe a Henry VIII sort of thing, but he has a son, so that can’t be it. 5. On the flip side, what happened to Miranda’s husband? A: Many have asked about the birth parents. One day, there will be answers. 6. While we’re on the subject, Roland met Miranda, a shoemaker, when she was summoned to the castle to give the king a new pair of slippers and it was love at first sight. How does a village shoemaker get such easy access to the king? What if she were dangerous? Is this why Roland is so beloved, because people can just approach him? I can’t even get an audience with my congressman. 7. It’s obvious that Roland and Miranda get married very quickly after meeting. Why the shotgun wedding? Was she pregnant? What happened to the baby? Did she have dirt on the king that she used to blackmail him? Or is Roland a serial monogamist who needs to be in a relationship at all times? 8. Why doesn’t Sofia meet her (step)father or (step)siblings until the day of the wedding? They never had a get-to-know-you dinner beforehand? What about the rehearsal? A: Sofia met her siblings before the wedding. Sofia is formal in Once Upon a Princess because she barely knows them and is nervous and excited. 9. When Rapunzel shows up to help Sofia and Amber, she has her famous long blonde hair, which she uses to help them get out of a hole in which they’ve fallen. However, the last time we saw her, it had been cut off and turned dark. In fact, this was the reason there was no sequel (apart from the short Tangled Ever After). How? 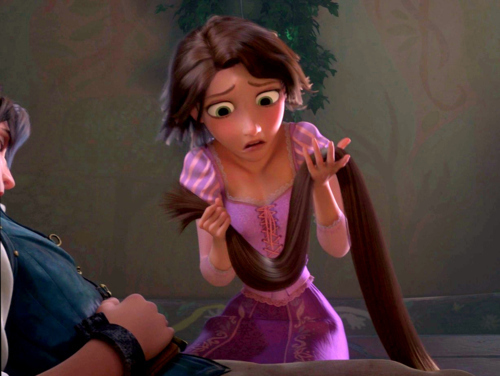 A: Watch the Tangled TV series next year and find out. Finally, this isn’t really a question, but in some episodes Sofia is incredibly clever, insightful, and prescient, yet other times she’s completely naive or, worse, disbelieving. This is a girl that talks to animals and has princesses appear when she needs them, yet she’s still adamant that certain things can’t possibly be true. And she never learns from her mistakes. She is constantly betrayed by bad spirits and animals pretending to be good. I know this is meant to show how she has a good heart and believes in the human race, but I see it as a major character flaw. You are right. Sofia’s biggest flaw is that she’s too trusting. It will take her a long time to learn this lesson. Hope this helps. As I wrote to Mr. Gerber on Twitter, it’s amazing that he took the time to not only read my post, but also respond. It’s ridiculous to nitpick continuity, backstory, and character motivation of a children’s television show. I imagine it’s an incredibly difficult endeavor and it would have been completely understandable for him to have been annoyed or dismissive. But he wasn’t. He was a great sport about it. These answers have actually spawned more questions, but I’ll save them for now. In the meantime, I’ll just keep watching the adventures of the royal family from Enchancia. True, but this was written long before that episode. The answer that the Creator has given to the question about King Roland’s First Wife is given as – “One day there will be answers…” But according to the latest update in the news, the first Wife’s story is related to the episode ‘When you wish upon a well’, in which Amber found a well which grants a person 3 wishes. In the episode, King Roland says – “I had completed one of my wishes before and it didn’t turn out to be nice”. In the episode, when Amber found the gate to the wishing well, the gate was rusted and there were about 4-5 locks on it, also when Amber asked the King about his first wish, he said – “We’ll talk about it later, it’s a different story…” hiding many questions for the users. Yes. Exactly what I was going to say about the well. Alternatively the secret garden in the episode where Sophia throws a tea party made me think about the book The Secret Garden. The mom falls off a rope swing while pregnant. My burning question is why isn’t Aunt Tilley queen? She refers to Rollie as her baby brother? Similarly why is James King for a Day before Amber although she is older? Lastly when Roland disappears on Wiselia, why does Miranda say, “maybe someone should go look for the king…” Isn’t she’s in charge if the king is missing? Presumably, Enchancia uses a line if succession that favors boys over girls like many historical kingdoms. I’ve always believed Enchancia was based on Old Britain. For example, Mary was King Henry VIII’s eldest child, followed by Elizabeth, but his son Edward became King first despite being the youngest of the three, then Mary on his death, and Elizabeth on Mary’s death. Several people have said that. Maybe one day they’ll answer it. I want to know what happened to Sofia’s dad and I want to know what happened to amber and James’s mother. I also want to know if Sofia is still a part of the Merry band. I also want Sofia to be the one to break out into song. I love it when Sofia sings (I don’t mean to be mean or anything). I know this is old but I want to know why Sofia can’t understand What Not (the squirrel). I still am curious about the wish Roland made at the well lol anyone ever get answers about that? Yes, any answers as to what his first wish was? I really want to know. Thank you for making a children’s show that my nine month old granddaughter rocks to every day. She loves it…she really watches it…it’s crazy and now I love it too!! I think there maybe a more narassitic theory to King Rolands Wish. Axing Roland the 1st for him to become king. It was then easier for him to summon Miranda The shoe maker and make “make” an honest woman out of her. However what doesn’t add up is Sofia’s older siblings. Who was their mother? Wow, so, basically no answers at all. At least the creators gave us the ending we deserved, the answers we needed, but unfortunately, not a season 5 which we wanted. They are still magnificent people for making such a spectacular series!